So I hired a new personal assistant this week. Her name is Barbra. I’ll properly introduce her to you in a few days I reckon. One of the reasons I choose Barbra to be my assistant over the 52 other applicants was because she’s a yoga instructor. 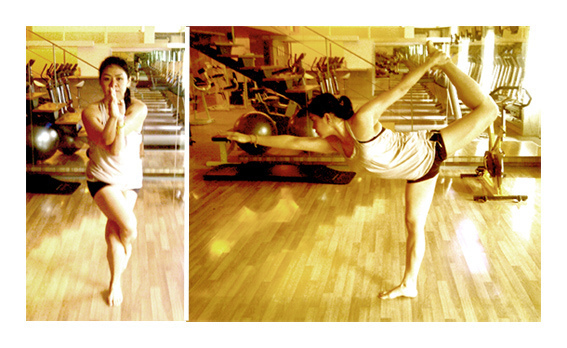 Actually, she’s not just a yoga instructor but a Bikram Yoga instructor. Bikram Yoga is a sequence of 26 postures selected and developed by Bikram Choudhury from Hatha Yoga. These postures are done in a studio which is often referred to as “The Torture Chamber” where the heat is a blazing 105 degrees. Before this Bikram experience I’ve only participated in one private Vinyasa Flow session and one Vinyasa Flow class at Core Power Yoga. Other than those two sessions, my only experience with yoga has always been short little 10 minute sessions following instructors on my Apple TV, or doing a couple warmup stretches before surfing. To be honest, I was a bit apprehensive of taking this Bikram class. I had posted a question on my Facebook profile asking my friends what they thought of Bikram Yoga. Since I have dozens and dozens of friends that are either yogis or have participated in yoga in some form so I was curious to see what kind of feedback I’d get. Of course, the reactions where just as I thought. It seems many people absolutely love the Bikram experience, while others complained it’s cultish, boring, monotonous, too hot, too militant, and quite smelly. People are quite passionate about their opinions with Bikram and this type of feedback was exactly what I like to see. Anytime the crowd is that divided and opinionated about a matter, it interests me big time. However, I have to admit, after hearing all the stories and reading all the Yelp reviews, I was a bit scared. Thankfully I like being scared and I was cherishing that feeling as much as possible. To add to the fear, Barbra brought over a friend and coworker to help talk me into taking part in the experience. I arrived about 15 minutes early and everyone was very welcoming. Oh, I forgot to mention, I was still pretty stoned from some crazy kind bud I had smoked earlier in the day. I’m not sure if that was very beneficial or not, but it sure did add to the anxiety and fear, which I kind of like. Upon arriving I saw dozens of people exiting the previous class. They looked spent, nearly naked and dripping sweat everywhere! “I can do this” I kept telling myself. As I entered the studio, I could instantly feel the heat afire. And yes, the odor wasn’t exactly like a Febreeze commercial. However, it was tolerable and was somewhat expected. Thankfully this studio had wood floors instead of carpet which sounds like a miserable combination with sweat dripping on it all day. With my luck, I get positioned right next to this smoking hot girly. Figures. The last thing I need at this moment is any distraction or eye candy messing up my practice. However, I’m happy to say that I was so focused on my own thing that I quickly forgot about any of the gals in the studio within seconds. And if you know me, that’s a big win in my book. Within 10 minutes of the class I’m already wondering if I’m going to be able to last the entire 90 minutes. My shoulder was already starting to hurt a bit from a previous injury and if I was this exhausted in just 10 minutes, how the heck was I supposed to make it until the end? The goal of the first class was to simply stay in the room the entire time, and to keep my mouth shut. I think I probably came up with a killer 5 minute stand up comedy set during the class and it took every bit of discipline possible to not bust out the jokes aloud amid class. Upon the wall was a clock and a thermometer. I’d advise you to not look at either. Looking at the clock just makes the time go by slower, and looking at the thermometer makes you start second guessing yourself saying… “Is my body getting slow roasted at 113 degrees?”. Once we made it through the first half of standing poses, we then laid down for the second half of the routine. Thank god! At this point laying down was more welcomed than a UPS driver at Christmas. I finished out the routines and was then doused with a cool lavender cloth across my face as I laid motionless on my soaked towels and yoga mat. I Made It! And I participated on all the poses with the exception of one. All in all, I’m claiming victory. In fact, it was such a victory I treated myself to a cold frosty Yellow Tail Ale at dinner after the class. This was beyond refreshing since I hadn’t had a sip of alcohol in 12 days. I limited it to just one brewski, and then headed home to crash like a kamikaze pilot on my pillow top bed. Upon laying down at home I did notice that I had a bit of a headache lingering. I’m guessing this is because I didn’t properly hydrate myself before the class. I did drink a few sips of water, but next time I think I’ll turn those sips into guzzles. My body felt great. The intense sweating felt great too. The encouragement from Barbra was fantastic and having the class sing you happy birthday on your welcoming day was quite nice too. All in all, I’d say it was a positive experience, but I want to reserve my final judgement until after I take 10 classes. I’d like to experience a few different instructors, go less stoned, go more stoned, be more hydrated, and try to get deeper into the postures. The main thing that I really enjoyed was the fact that my mind was very present in that room for the entire 90 minutes. I can’t think of a single moment where my mind was wandering outside of that room. And I was highly impressed with myself for not lurking in booty shots out of the corner of my eye. I was completely present with the routine. After meditating for almost 18 years, I know just how difficult it can be at times to get to a place of “No Mind”. Just achieving 5 minutes of no mind can be a huge success for myself, but during this Bikram class there were many 5 minute chunks that my mind was just empty and focused on my breath, posture and practice. This was good. Very good. I look forward to another class, maybe tomorrow. I was going to go again this morning but as I awoke I still had this lingering headache. It’s nothing that a few glasses of water and a quick surf session won’t cure though. PS: I know there has been a ton of negative press and sexual allegations about Bikram Choudhury recently. I personally have not paid any attention to it, and to be honest, I don’t really want to. It’s the practice that I want to focus on, not some dude who I don’t even know. My heart goes out to anyone who’s been wronged in any way. It would be a shame for the actions of one guy to disrupt so many studios, instructors and clients who obviously get a ton of benefits from this type of yoga. So, as they say…. Namaste!